I wanted to do something cute and fun for Easter, even though I don't really celebrate it. Unless, you count stuffing my face with candy and that's usually after Easter, when the candy is on clearance. None the less, I've always wanted to make something out of recycled art. I collect things left and right all the time expecting i'll use them eventually and the time finally came for these. 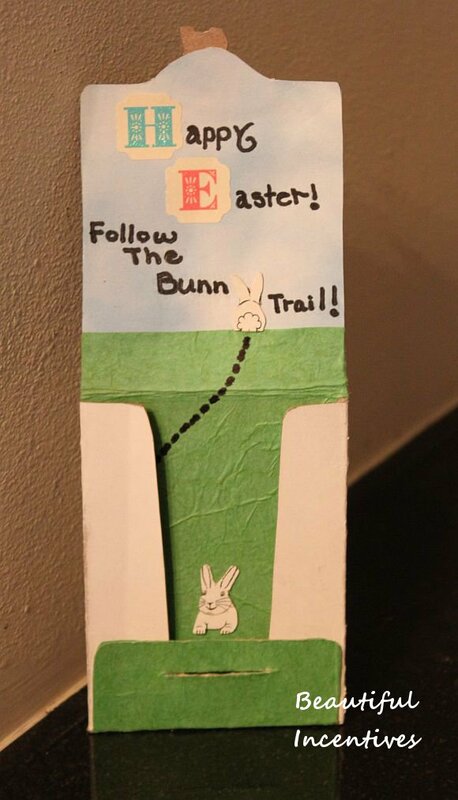 I made up this cute little Easter Egg hunt hints holder. If you have Easter egg hunts with your children, this might be fun for them. I loved hunting for eggs when I was little and would have found this amusing. I'm not sure how popular it would be for every child, but it's just something that came to mind that would make an Egg hunt a more creative experience. Everything I used to make this did not cost a penny, sans the glue that I had to buy at the dollar store. I could not find mine! That was it though. I have to forewarn, this is not perfection. I used what I found around my house, so the cardboard isn't great. An old Starbucks Via mini holder. Not sure if they sell these exact ones anymore. Cheap cardboard from the backing of something that was 8X10. I think It may have been from a pack of printer paper. It comes in a lot of things and I always save them. Sufficed to say, you'll see jagged edges, as this was not the perfect medium to use for folding, but it's what I had on hand. You may opt for something tougher or to cover all of the board. Scrapbooking papers and tissue papers in various sizes, that I bought from the Target dollar section. 2 small boxes of Annie's pasta, for the rabbit cut outs. Alphabet stickers I got on clearance at Target a while ago. 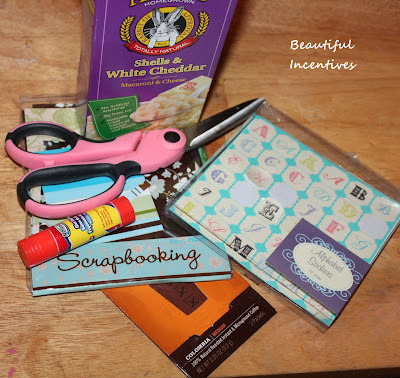 You can get these at any craft store, usually in the sticker or stencil aisle. Paper glue stick, or Hodge Podge. My glue stick was not so great, so I don't advise the dollar store for that! Normally I love the Dollar stores, but opt out of generic if you can. Some carry Elmers which is usually a good brand. 1. I started out by un-sticking the Starbucks mini via holder and then tracing the shape on the cardboard. 2. Then I cut out the shape traced on the cardboard and folded exactly where the Starbucks holder folds. It was easy to mimic the folding with this kind of cardboard. It dented easily. If you use something tougher. I would mark with pencil where the folding lines should begin. 3. For the small flap inside at the bottom, I used tiny nail scissors to cut the slit for the tab to go through. You can use an exacto, but I didn't have one on hand. 4. Once folded, making sure that everything is even, unfold and cover the front and insides with scrapbooking papers. You can measure out how much paper you need or lay the paper on the cardboard and cut off the excess. Most of my papers were pre-cut so I just cut off the excess. I didn't have enough paper to cover all of the cardboard so I made do. I used the green tissue paper to mimic grass and then the cloud paper to look just like a sky above the grass. *When you cover the small flap at the bottom with the green tissue paper, just lightly cut the slit open again. 5. Then I cut out the rabbits on the back and side of the Annie's pasta box. Careful to use good scissors and cut very slowly, as it's super easy to over cut. Make sure to have at least two boxes for back up. I over cut my lil rabbits ears on the second one, but that's ok. All people don't look alike so why should rabbits. 6. Carefully glue the back of the rabbits and place them just over the tab, letting the feet fall outside the tab. 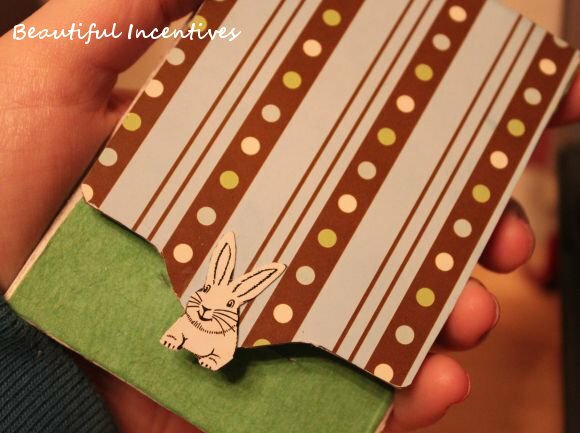 This ensures that the rabbit will be showing just his eyes and ears when peaking out of the card before it's opened. 7. Decorate the inside any way you like. I decided to use the back end of the rabbit as a start off point for a trail. Since this is a hunt for eggs, I thought "Follow the Bunny trail" would be cute and the shape of the bunny fit perfectly for the Y in the word bunny. Use the stickers to say Happy Easter or whatever you would like. 8. 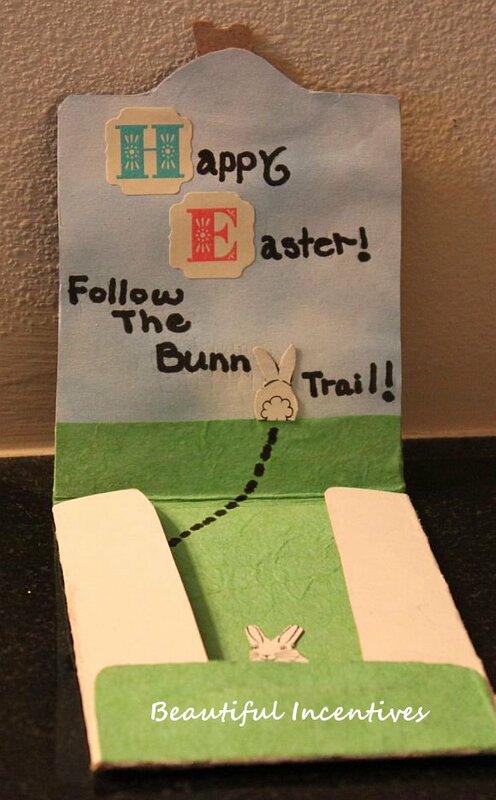 I didn't make the hint cards, but when the holder is all ready, you can measure out some index cards or pieces of paper to fit the pocket and put little hints about where they can find the eggs. All done! I tied a piece of lace around the holder for show, because I like to make everything dainty like that. I think i'll do more things with these little holders and the bigger ones. They'd make great gift card or tea holders for any occasion! Let me know if you did this and if your kids enjoyed it! I'd love to see some variations or hear some stories! That is totally adorable! I wish I was crafty! That is a great idea! I'm going to have to see what I have on hand that I could make one of these for our Easter egg hunt. Thank you so much! Oh how cute, I love it! I was wondering what you were up to, its great! That is so cute! I am totally sending a link to this to my sweet granddaughter who loves crafts like this!! Thanks! super cute, and crafty. I love the colors! super cute! AND recycled RIGHT ON! that is super cute, how creative. we have so much recycling i need to dig in. What a cute and creative idea and how fun for the kids or adults!Love that you were able to do it very inexpensively with what you had around the house. That is super cute and cleaver! That such a cute idea. I wish I was that crafty. This is adorable!!! I love crafts, but usually screw tings up when I try making them.... this looks relatively easy though, I should give it a try! Too cute, pined and shared it. You are so creative! This is so cute! Thanks for sharing. 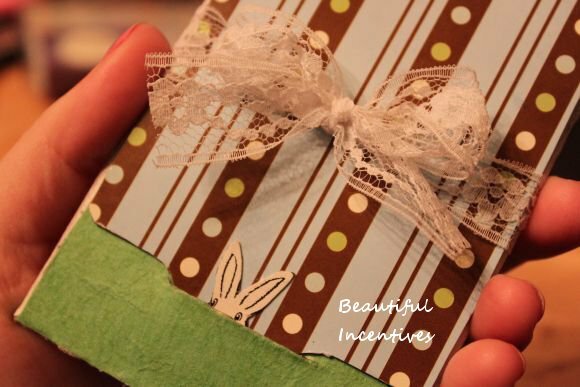 I have been trying to find cute crafts to do for Easter!